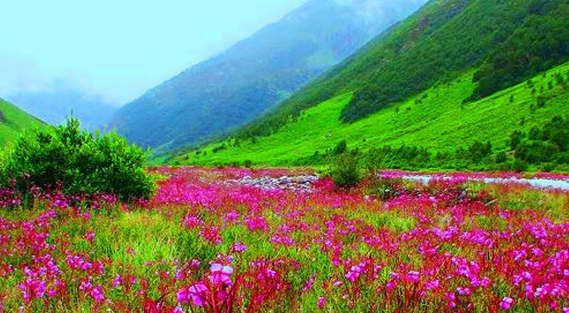 Valley of Flowers National Park is an Indian national park, located in West Himalaya, in the state of Uttarakhand and is known for its meadows of endemic alpine flowers and the variety of flora. This richly diverse area is also home to rare and endangered animals, including the Asiatic black bear, snow leopard, musk deer, brown bear, red fox, and blue sheep. Birds found in the park include Himalayan monal pheasant and other high altitude birds. At 3352 to 3658 meters above sea level, the gentle landscape of the Valley of Flowers National Park complements the rugged mountain wilderness of Nanda Devi National Park to the east. Together, they encompass a unique transition zone between the mountain ranges of the Zanskar and Great Himalaya. The park stretches over an expanse of 87.50 km2 and it is about 8 km long and 2 km wide. Both parks are encompassed in the Nanda Devi Biosphere Reserve (223,674 ha) which is further surrounded by a buffer zone (5,148.57 km2). Nanda Devi National Park Reserve is in the UNESCO World Network of Biosphere Reserves. Nestled amid the Himalayan Ranges, Sri Hemkunt Sahib is a sacred pilgrimage revered by thousands of Sikhs every year. Literally meaning 'Lake of Snow', this holy pilgrimage site is perched at an altitude of 4329 m above the sea level and lies in the backdrop of snow - clad mountains. The shrine is also known as Gurudwara Shri Hemkunt Sahib and can be reached by trekking through numerous waterfalls, thick forest and captivating views of the Himalayas. The gurudwara is open only for few months and close down during the extreme winter months. Visited by a myriad of devotees from all around the globe, it accounts for the highest Gurudwara of the Sikh community. Adorned with a beautiful scenic view, the holy place offers tranquillity away from the din of the city and into the lap of nature. According to the 'Bachitra Natak', the autobiography of Guru Gobind Singh Ji, Hemkunt Sahib was the site which housed the seven snow peaks where he meditated in his previous birth. In spite of its relatively perilous terrain and harsh cold climate, thousands of pilgrims visit the Hemkund Sahib every year to witness the crystal clear water of the lake and to seek the blessings of the Almighty. Resting in the Western Himalayas, the Valley of Flowers in Uttarakhand is a lively and beautiful national park famous for its meadows of alpine flowers. Combined with Nanda Devi National Park, the two of them together constitute the Nanda Devi Biosphere Reserve. It was also included in the list of the World Heritage Sites by UNESCO in 2005. Initially known as Bhyundar Valley, its name was changed to Valley of Flowers by the British mountaineer Frank S Smythe in the year 1931. Gifted with a diverse range of flora and fauna, this picturesque beauty is one of its kind. Situated high in the lofty Himalayas of the Garhwal region, this enchanting valley is also considered as the place from where Hanuman collected Sanjeevani Buti to cure Lakshmana. The verdant pastures, beautiful mountains, and running streams attract millions of tourists every year from all over the world. No human settlements are present inside the park and grazing is completely banned. Since it is a UNESCO World Heritage Site, many international travellers visit the biosphere reserve. Situated in the transition zone between Eastern and Western Himalayan flora, seven restricted-range bird species are prevalent in this part of the Himalayas. The trek to the valley of flowers is indeed a one to remember for it is lined up with wild rose bushes, perfumed wildflowers and wild strawberries. It is a must-visit place for all those who love serenity combined with nature's beauty. Nanda Devi National Park, established as a national park in 1982, is overshadowed by Nanda Devi Peak. This national park along with the Valley of Flowers was recognised as a World Heritage Site by UNESCO in 1988. Sprawling over an area of 630.33 sq km, this national park is encircled by several peaks such as Trishul, Dunagiri, Nanda Devi, Bethartoli and Nanda Devi East. Part of the Himalayan Biographical Zone, this national park is home to several varieties of plants and endangered species of animals. Some of the rare species of animals found in this park include Asiatic black bear, snow leopard, brown bear and blue sheep. In addition, Himalayan musk deer, Himalayan black bear, goral and serow are some of the other animals found in this national park. The main vegetation found in this forest comprises birch, rhododendron, fir and juniper. However, the vegetation of the park changes to alpine from the place, which is called Ramnani. From this place, the vegetation is dominated only by Juniper Scrubs. In total, there are approximately 312 floral species in this national park out of which 17 are considered rare. The best time to visit this national park extends from the month of April to the month of October. This area is home to several rare and endangered species including the Snow leopard, Asiatic black bear, musk deer, flying squirrel, tahr, brown bear, red fox and blue sheep. However, the density of animals is very low. Among the birds, Himalayan Monal Pheasant and other high altitude birds can be sighted in this National Park. Among flowers, orchids, poppies, primulas, marigold, daisies and anemones are very abundant. However, there are more than 500 species of higher plants in this area. Some of these plants also have medicinal values. Located amongst the supreme environs of the majestic Himalayas, Gaurikund in Guptakashi, Uttarakhand, is famous for being the starting point to and the last road head before the Kedarnath Yatra begins. Gaurikund is located on the banks of the River Mandakini and is rightly considered to be the gateway to spirituality and salvation. Situated in one of the most captivating settings, this is a place of infinite beauty, breathtaking landscapes and immense devotion, all rolled together into one. Located at an altitude of about 2,000 metres above the sea level, the place is highly regarded by devotees, who consider this place to be a base camp for the trek to the Kedarnath Temple, that is situated high up in the mountains. Other than this, the Gaurikund Temple and Gauri Lake are also important landmarks that the place is famous for. After the disastrous floods shook Kedarnath in 2013, the original trekking route from Gaurikund to Kedarnath, via Rambara, a total walking distance of 14 kilometres, was completely washed away. However, after this sad event, the trek route has improved considerably and is now absolutely safe, complete with all facilities, thanks to the efforts of the Nehru Institute of Mountaineering (NIM). Today, Gaurikund has decent accommodation options in the form of dharamshalas, hotels and guest houses. Trekking is the main activity that takes place here. The entire area resonates with piety and spirituality, not to forget the mesmerising beauty and grandeur of the Himalayas in the backdrop. The area is almost always under cover of a snow blanket, except from March to November, which further adds to the immaculate gorgeousness of this destination. Uttarakhand is the home to many big meadows / bugyals and the grass fields. The term bugyal is used for meadows in Uttarakhand, where animals are left to graze the fields. Bedni Bugyal is considered the most beautiful bugyal in Uttarakhand. The base for Bedni bugyal is Lohajang or Wan, which can be reached from Karnaprayag or Nainital via Dewal. Bedni is at a height of almost 3354 mtr and one is captivated by the beauty of the landscape. The trek to Roopkund goes via Bedni bugyal. This bugyal has its charm and one gets spellbound by its natural beauty endowed upon by Mother Nature. The lush green field would look like artificial carpeting on undulating fields of Bedni Bugyal. To reach Bedni Bugyal, one has to travel by motor vehicle till Wan which is the last road head. From Wan, another 11 km trek will lead you to this beautiful place. It is possible to scale this 11 km trek in a single day, provided you start early morning from Wan. The distance of Wan from Karnaprayag is 88 Km, which is a major halting station along the National Highway to Badrinath. One can also take journey from Rishikesh to Karnaprayag on first day and take night halt in Karnaprayag. Next day early morning, the departure to Wan should be made early, since it can take 4 hours to reach Wan from Karnaprayag. Perched on the Garhwal hill tracks, near Alaknanda River, the most sacred Badrinath Temple or the Badrinarayan Temple is dedicated to Lord Vishnu who is worshipped as Badrinath by lakhs of devotees every year. The temple is also one of the four Char Dham and Chota Char Dham pilgrimage sites. It finds its mention in the 108 Divya Desams devoted to Lord Vishnu in India. Situated at the height of 10,279 feet, the temple is surrounded by lofty snow-clad Himalayas and is a paradise for nature lovers also. The religious importance and purity of Badrinath Temple allures scores of devotees. Believed to be originally established by the saint, Adi Shankaracharya, the black stone is considered as the manifestation of Lord Vishnu himself. The main gate of the shrine, painted with myriad colours is surely a treat for your eyes. It has not only the image of Lord Vishnu but, several other gods and saints are housed inside the temple. The immaculate carvings and designs in the main hall will blow your mind. A visit to this holiest shrine makes you attain salvation. The temple with its purity and serene beauty brings you to a different world, bereft of chaos and sins. From November to April end, the temple remains closed due to extreme weather conditions. Badrinath Temple has a Tapt Kund, a hot water spring which is considered to have medicinal values. The vibrant festivals of Mata Murti ka Mela and the Badri Kedar Festival give you another reason to visit the temple. Both these festivals are celebrated with vim and vigour. A perfect blend of sanctity and natural beauty, Badrinath Temple is the best weekend getaway for you! A beautiful town named Govindghat is situated on the way to Badrinath at the point where the Alaknanda River meets the Lakshman Ganga in the Chamoli district of Uttarakhand. An immaculate destination situation in Garhwal, Govindghat is not just meant for the religious lovers but also for the ones who love adventures. Situated at an elevation of 1800 m, it is a base for most of the treks including the one leading all the way to the Hemkund Sahib and the marvellous Valley of Flowers. The Gurudwara is situated on the right bank of the River Alaknanda and is an important landmark of the place. One can also find places to stay in here amidst the beauty of nature and the rolling hills. Ghangaria is another base point which comes after Govindghat from where the trek to Hemkund and Valley of Flowers begins officially. Govindghat showcases refreshing views of the alpine hills covered in mist. It is one of the best places to visit if you are looking for a place that offers peace and is a perfect getaway to find solace to break away from the monotony of your routine. Vasudhara Falls is one of the famous tourist attractions, which lies in the Mana Village. These falls are surrounded by beautiful mountain peaks and are situated at a distance of 4 km from Badrinath. The water of this cascading falls flows down from the height of 400 ft and is situated at an altitude of 12,000 ft. It is believed that the water of Vasudhara Falls turns away from the visitors who are not pure at heart. From a distance, the water of the fall seems to be like milk flowing down the mountain. Bheem Pul is situated opposite to the Vyas Gufa in Mana Village. It is a huge rock which acts as a natural bridge across the Saraswati River. The Saraswati River flows with force in between the two mountains and joins the Alaknanda River. It is believed that Bheem, one of the five Pandavas, threw a huge rock in order to make a path to join the two mountains so that Draupadi could easily walk over it. Lakshman Ganga or Bhyundar Ganga is a Minor River that flows through the Bhuyandar Valley, from Hemkund Lake. It merges with Pushpawati River in Ghangaria.This is also called Byundar Ganga, and can be classified one of the smaller rivers that enrich the beauty of the Bhuyandar Valley running through the same. Its origin can be traced back to the Lake of Hemkund. After a considerable distance of journey, and quite a few areas that are covered, at the city of Ghangaria, it joins with river Pushpawati. The other important fact about the Lakshman Ganga river while flowing through the city of Govindghat is that it is sometimes classified as being the tributary of River Alakananda. River Alakananda is itself the tributary of the River Ganga, so Lakshman Ganga can also be called as the distributary of River Alakananda. Since the river is connected to the river Ganga, this rives assumes some religious importance amongst the rivers in Uttaranchal. There are some theories that believe that the Lakshman Ganga is not just one river but made up of two rivers that have merged at some point into one. The two rivers that supposedly make up the Lakshman Ganga are the Pushpavati and the Hem Ganga. Of these, the Pushpavathi has been traced to be starting from the beautiful and mesmerising valley of flowers, while th Hem Ganga seems to originate from the Hem Kund. It then forms a Tributary to Alaknanda in Govindghat.The length of the Lakshman Ganga from Ghangaria to the point where it forms a tributary to Alakananda, GovindGhat is a total of 14 kms. Pushpawati River is flowing from the dark mountain of Uttarakhand, this riVer is flowing near the Valley of flowers, on the way to badrinathji. Very beautiful place.The Pushpawati rises from the East Kamet Glacier, near Rataban, at the base of the Himalayas near the central part of the Garhwal-Tibet border. It flows in a southerly direction to join the Bhyundar Ganga near Ghagharia. The combined stream is thereafter known as the Lakshman Ganga. The latter merges with the Alaknanda River at Govindghat. The Puspawati drains the Valley of Flowers. Pushpawati River originates from the glacial deposits around Rataban and Nilgiri ranges in Uttaranchal. It traverses across the Valley of Flowers dividing it into two sectors. A wide trace follows the Pushpawati River, first on the left and then on the right bank. At Ghangaria village the river converges with the Hemkund Ganga. Kundalinisen Plateau is located on the banks of this river. At Ghangharia, the Pushpavati River meets the Lakshman Ganga flowing from Hemkund.